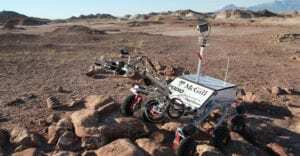 The McGill Robotics team designed the robot to participate in two international competitions which required every team to operate their rover, from a hidden control center, in a Mars-like desert environment through various runs to accomplish complex tasks. These tasks involved traversing rough terrains, carrying payload to remote locations, servicing a complex control panel, and analyzing collected soil samples. During every run, the teams were expected to wirelessly operate their rovers on more than 1 kilometer and continuously rely on sensor feedback provided by the onboard IMUs, GPS, cameras, and scientific instruments. The acquisition of the SBG Systems’ IG-500N between the two competitions was paramount in the team’s success at ERC. The precision of the IG-500N singlehandedly allowed us to score highest for the blind navigation task, in which we are meant to navigate to GPS coordinates in a hard terrain without using cameras. The device allowed us to immobilize ourselves 20 centimeters away for the last waypoint, after over 500 meters of blind navigation, which had never been accomplished before at the competition. The Mc Gills effectively integrated the sbgCom library distributed with the IG-500N in their software architecture with a C++ wrapper. They used the initialisation function in the constructor of the class and implemented the callback functions for thread-safe operation, so as to keep receiving updates from the device in continuous mode without interrupting the transmission process to the rest of the system. This was then used in the creation of a ROS publisher. The quality of the library’s implementation and interface design made this whole process very user-friendly and quite easy. 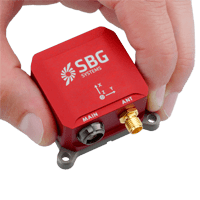 We are immensely grateful to SBG Systems, as our distinguished achievements at the European Rover Challenge would undoubtedly not have been possible without SBG Systems’ exceptional assistance.